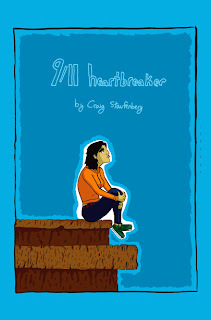 IADW) 9/11 heartbreaker is a pretty personal, thought-provoking story. 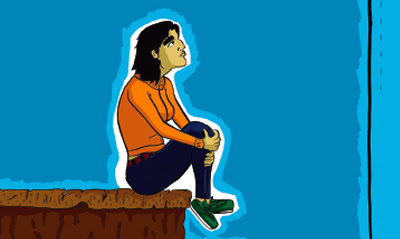 What influenced you to steer this work towards comics? Craig) Well, 9/11 heartbreaker didn’t start out as a comic in my mind. There were a few different mediums that I considered while working on the project, and I don’t think I fully understood that it was a comic until the last 6 months or so of the work. I like comics because they offer a really accessible way to tell stories these days. Pretty much anyone can pick up a comic book and get something from it. This accessibility was really important to me because the book itself has a lot of layers and thoughts running through it, but I didn’t want its complexity to overwhelm or intimidate anyone away from reading it. Everyone who has picked it up and read it has gotten something from it the very first time, and most people are reading it multiple times and discovering new corners of the book to explore. Comics can do this better than pretty much any other medium out there. On the surface they are simple and direct enough for anyone to pick up and understand, but the medium also gives you a lot of tools to create some real depth. IADW) 9/11 heartbreaker is a story of the love of one character, as she explores her thoughts on September 11th and those of the people around her, addressing more issues as she does so, all within 28 pages. Did you feel the pull to let the tale live beyond issue #1? Craig) The book certainly went through an extensive writing and editing process to get it down to its short length while still covering a lot of ground. While the book is only 28 pages long it took me 6 months of research and an additional 8 months of solid work to write. And even after that time I did a considerable amount of editing and cutting when I started to draw and design it. So in many ways, yes, there was a lot more that I could have said and there was a lot more that I could have included. But while what was cut had value, as a whole it didn’t add up to as powerful a story as what remains, so it was all easy to cut. It’s possible I’ll return to these characters again but I have no immediate plans to. Still, the book’s themes are still themes that I find myself powerfully drawn to- namely memory, history, how we situate ourselves in the world, and the passing of things- so they will certainly be present in other work. IADW) I have to admit I was a little sceptical to read this based on the title. Much has been done with 9/11 - some great, some not so great - that you can get a little jaded to '9/11' stories. However 9/11 heartbreaker isn't just a 9/11 story - how do you explain the books relation to it's title? Craig) The title 9/11 heartbreaker is already proving itself to be a double-edged sword. On the one hand it’s a very aggressive title and it can make people skeptical or put-off, and I think it’s probably going to keep a good number of people from picking up the book until they hear more about it and understand what it is and what it isn’t. On the other hand I think the title works for people who do pick up the book. The title is the most direct and shocking aspect of the whole book, but if you can get past it you’ll be able to relax into the book itself and feel it with a wall or two down. And of course, you are absolutely right that the title is misleading. For starters the book isn’t really a 9/11 story. There is a 9/11 story in there, but the event and the memory of the event simply serve as a catalyst to help open up the narrator to a different way of looking at the world and her place in it. It also isn’t a heartbreaker in the traditional sense. When most people think of that word they think of a tearjerker, or that kind of emotionally exploitative story that does nothing more than hit you over the head repeatedly with the saddest things the writer could think of. This is not that kind of book. The kind of heartbreaking I’m talking about is that delicate balance between hope and sadness that engages the heart in a soft manner. One use of the word makes you numb, the other keeps you feeling, and 9/11 heartbreaker falls into the latter camp. IADW) The art perfectly matches the books conversational tone. As writer and artist, how did you approach the story's visual aspects? Craig) One of the benefits of writing and drawing the book myself was the fact that I could think of the presentation of the story as a whole, and how each visual aspect of the book could contribute to telling the story. So much of art these days is either bland and made via committee, or feels like each person working on it is trying to show off and compete with everyone else working on it. From the beginning I knew that I wanted to create a unified voice for the book that told the story as effectively as possible. This meant a real focus on simplicity. While some panels and pages have a lot of detail, overall I found myself simplifying the visuals every chance I got. There were a number of pages I redrew and redesigned entirely that looked great originally, but were too busy to tell the story smoothly. Visually I also didn’t take anything for granted. Every aspect of this book was thought through and intentionally designed- from the lettering to the pencils to the inks to the panel borders to the panel layouts to the gutters to the colors. I saw each of these as a potentially powerful tool on its own, and treated them all with their due respect and consideration. I wanted the story to move smoothly but I also wanted the book to look rougher and hand crafted to give it a level of warmth that most modern books lack. 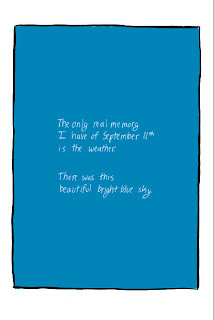 IADW) Right from the opening page this graphic novel starts off strong, with a single clear blue box and text that hooks you on a personal level. Was this almost graphic free start how you originally planned to kick things off? Craig) Actually the front cover image was originally going to be the first page. 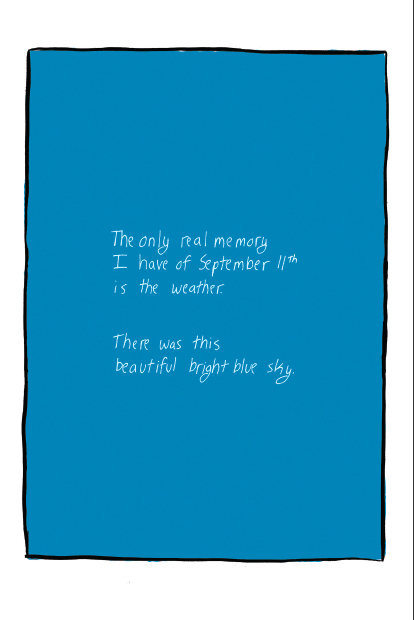 There was also going to be a lot more text on page one, mostly more of my own personal memories of September 11th. But when I started to add all that text to the image the page just became very crowded and cluttered and it lost so much of the impact that I wanted it to have. I pared the text down to that one line, and then realized that it was stronger on its own without the image. In the end I like how it all works. The title and the first page hit you hard on an emotional level, and then the book takes a step back and eases you in to the story. IADW) When I was a councillor the biggest roll-on effect was that people in the street weren't nameless faces anymore. They were walking thoughts, fears, loves, experiences etc. That's why the scene where the main character sells movie tickets to two strangers, then turns her head in their direction after they have left resonated with me. She now actually sees people too. Craig) I’m happy that scene resonated with you, especially since it’s just a couple small panels at the bottom of a page. In many ways that’s what the goal of the book was- to help people see that 9/11 doesn’t have to just be used for divisive political purposes, that tragedies can also open us up to a more aware way of seeing the world around us. Having read this far, if you'd like to see how 9/11 heartbreaker resonates with you, Craig has a pretty sweet deal that will allow you to do just that. Order a printed copy of 9/11 heartbreaker by clicking on this link, and if you forward your receipt to this email address, he'll send you a FREE hi-res pdf version to tie you over while you wait for the snail mail copy to arrive - now you can't ask for more than that! Thanks for your time and efforts in doing the interview Craig - and I look forward to seeing what comes next from memoryisfiction.com. Thats a great interview Dan! Well done on the great story. i will have to keep an eye out for the book now! Thanks guys glad you liked the interview - Craig was really great to deal with and I hope 9/11 heartbreaker really does well for him!